You have got to see all of these delicious Easter Peeps desserts that kids will love! 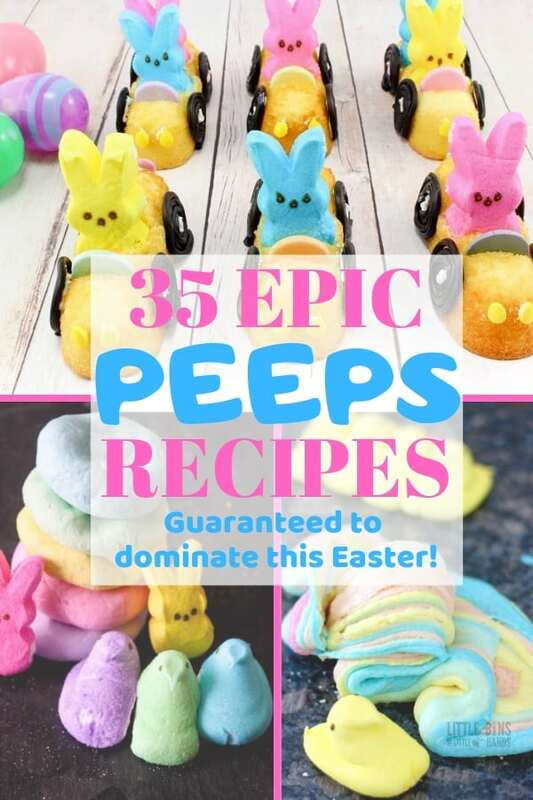 These unique Peeps recipes are sure to be a hit with anyone this Easter! One of my favorite holidays is Easter and it just so happens that has a lot to do with Peeps!! It’s pretty common knowledge that Peeps are one of those love them or hate them candies. They’re a lot like candy corn… people tend to have pretty strong opinions surrounding them. I have never been a big fan of marshmallows in general but for some reason, Peeps are DELICIOUS! I’m sure it’s probably all that unhealthy sugar and dye that they are coated with, of course. Regardless, I love them and I love finding inventive ways to incorporate them into recipes for Easter! 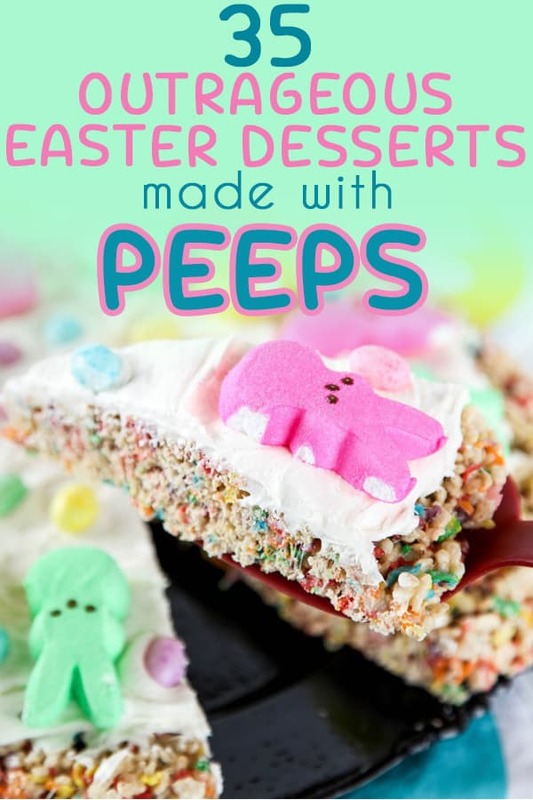 I found a ton of awesome Easter Peeps Desserts using the different varieties of Peeps and I am sure you are going to love them! What a fun and simple dessert to make for your Easter get together this year! This requires so few ingredients to make and the Peeps really make these a fun treat for the kids! I love using this awesome gadget from Amazon for all my chocolate melting needs! Ever have those times where you’re supposed to bring a dessert to a family event but have NO time to make anything? These Peeps pudding cups are one of the easiest Easter Peeps desserts ever! They are SO adorable, delicious, and super simple to make! What better way to serve up this classic Easter candy than in it’s own little homemade nest?! This dessert combines the best of both worlds; Delicious rice Krispies treats and peeps in one! Kiddos will love helping you mold these into the shape of a bird’s nest! As adorable as these little personal Peep houses are, they are SO easy to make. There is no baking required for this fun Easter option. Best of all, this would make a great afternoon activity to do with the little ones! These adorable little Peeps mobiles are made with Twinkies peeps, M&Ms, licorice, and sprinkles! I don’t know anyone who wouldn’t be impressed with these! The beautiful pastel colors of these whoopie pies are so fitting for Easter! This pan makes them so simple to make! I love that these classic sugar cookies are perfectly aligned with the peeps colors and that the marshmallow filling is even homemade! These adorable pudding cups are such a fun way to incorporate the classic peeps candy into your dessert this Easter! The bright colors and fun sprinkles make this one a huge hit with adults and kids both! Have you found some awesome Peeps desserts yet? I know, there are a TON of options! Keep reading though, there are plenty more to go! Why make regular S’Mores when you can add in so many amazing spring ingredients?! Plus, Nutella! What else do you even need to say? I love the use of Peeps in these in place of traditional marshmallows! The Peeps bunnies happen to have the most perfect ears for using as flower petals! Crazy, I know! These are a great addition to any Easter dessert lineup and they are a visual masterpiece without being difficult to create! Believe it or not, this recipe is even easier than it sounds. Yes, I am serious. So, while you COULD dip your Peeps in chocolate and proceed to make S’Mores with them, Peeps actually sells pre-dipped Peeps! You seriously can’t find any Easter Peeps desserts easier than this! I love how simple yet fun this recipe is! Without having to add a ton of extra ingredients, you are making each peep their very own birds nest! Kids will love helping with the sprinkles on this one. I happen to be a huge fan of cake in all shapes and sizes. The one thing I have always been terrible at, though, is getting the icing to look right on the edges. The peeps on this cake completely eliminate that problem! This one is a MUST for this Easter! Super elaborate and candy-filled milkshakes are becoming increasingly popular lately and it’s not hard to see why. They are not only beautiful to look at, but they are also stuffed full of delicious treats! This one is no exception! These colorful straws complete this fun Easter drink! While Peeps happen to be a classic Easter favorite, they don’t quite fit into every diet and lifestyle plan. This recipe for homemade Peeps is paleo friendly! Let’s face it, kids love dirt whether they’re in their fancy Easter dresses or their Saturday play clothes. We might as well serve up a tasty dessert that lets them feel like they are lucky enough to finally eat that mud pie they have been dreaming of! I absolutely love this idea of making egg-shaped rice krispie treats using Peeps instead of basic marshmallows! Not only do I personally think Peeps are more flavorful, but you also get such fun colors when you use them!! This is a fantastic and simple dish to bring to any family get together! These are the perfect 2-bite dessert! Utilizing Peeps for these add the extra flair of that Easter color while making them mini allows them to be just the right size for those kids who really don’t need that much sugar! The only thing better than brownies are Easter Peeps brownies! These are adorable and everyone likes brownies, meaning these are the perfect dish to make for Easter dessert! These little edible carrot decorations are the exact ones used in this recipe! This is SO gorgeous and colorful. Don’t get me wrong, I love a nice ooey, gooey, cheesy pizza as much as the next girl but this thing is SPECTACULAR. You have got to check out this recipe for Peeps pizza this Easter! I love making poke cakes partially because they are super fun and partially because you automatically know you will have the moistest and delicious cake ever. This one is no exception. I love the adorable “bunny garden” theme idea for Easter! These couldn’t be cuter and the colors are perfection. Kids always gravitate towards cupcakes (heck, so do I!) and these ones topped with Peeps make them even more appealing. This recipe is easy enough for anyone to catch on! I can NOT tell you enough how much I love the creativity behind this. Maybe it’s because I grew up eating those Flinstones push-up ice cream pops but I literally think these are so stinking adorable. I couldn’t help but tell Shannon of Joy in the Works how creative she is! We have already made these and plan to do so again and again! I also plan to try her Candy dipped Peeps Oreos recipe! If you aren’t following her on Pinterest, you should be! As much as we all love those store-bought Peeps, how cool would it be to create your own, at home!? With this recipe, you can do just that! Create your very own Peeps in your own custom shapes! I love this!! You absolutely have to check out this recipe, if for no reason other than a bit of humor. The post will make you laugh on a bad day and make you laugh hilariously on a good day. Not only that, your entire family will get a HUGE kick out of these Poop Peeps. Plus… how fun is that to say!?! Kids LOVE slime more now than ever and the trend of making it themselves only seems to get bigger by the day. I have a blast finding new and exciting ways to make slime so finding an edible slime that perfectly fits the Easter holiday couldn’t be more exciting! As parents we all know how common it is for our little ones to try a nibble of their playdough here and there. With this creative recipe for edible playdough made from Peeps, you’ll be just as tempted as them to eat your toy! These cookies are so easy to make and come out looking gourmet! This is the perfect cookie to make for those class parties, coworkers you want to spoil, or family and church events you bring a dessert for! One of my favorite lines in a recipe is “no bake” and this recipe definitely fits the bill! These not only turn out looking so cute when they are finished, but you also will never believe how easy they are to assemble. Plus, it’s almost guaranteed that they will be the first dessert to disappear from the table! The mini tins are easy to order from Amazon too! I only have one word for this recipe. Delicious. Nothing more, nothing less. Who says a dessert can’t be fun and healthy at the same time? That is precisely what these Peeps bunny kabobs are! Mix a bit of fruit with this fun Easter candy and you have the perfect balance of nutritional value on a stick! This cake will stun anyone who lays eyes on it. It looks like you spend hours and hours crafting an incredibly delicate sunflower when in all reality, there really isn’t much to it! Plus, who doesn’t love cake?!? I happen to have a kid who is a huge fan of white chocolate so this is a must on our dessert list. Recipes like this fit perfectly into a busy schedule. Melt some chocolate, drip a bit, you’re basically finished! I had no idea you could get Peeps molds. How did I not know this before? You can get them right here at a super affordable price and they are a genius idea! Cake. Donuts. In one? Add in Peeps and do you really need any convincing? These could easily be Easter breakfast if you ask me! Sure, maybe that’s a lot of sugar but hey, what are holidays for!? I LOVE the beautiful look of this and the fact that Easter Sundae is a cute spin on “Easter Sunday”. (Anyone else catch that?) These can’t possibly be messed up so if you struggle in the kitchen, put these on your Easter dessert menu for sure! Did you find a favorite Easter Peeps Dessert? I would love to know if you tried any of the above and what your favorites are!